If you frequently find yourself cropping (and re-cropping) stock images only to find that the end result doesn’t look particularly good in the format you need, say, on a mobile, then Photype is worth checking out. In short, it’s a handy, simple Web-based tool that lets you search across multiple repositories individually. Currently, it supports nine services, including Shutterstock and Getty, as well as free options. The overlay the site uses for choice of image source is so transparent that we had to alter the contrast here to get it to show. It doesn’t look exactly like that. Once you’ve selected your source of image, you can search for anything you might want a shot of – obviously, we use a lot of smartphone shots on TNW, so looked for a generic ‘Android app’ image for this test case. Selecting an image from the left panel gives you a bigger version and changing the crop layout using the buttons below the search bar gives you a preview of how it will look when resized for different displays, thereby saving you the trouble of having to crop an image only to find out later that it’s not really going to work for you. 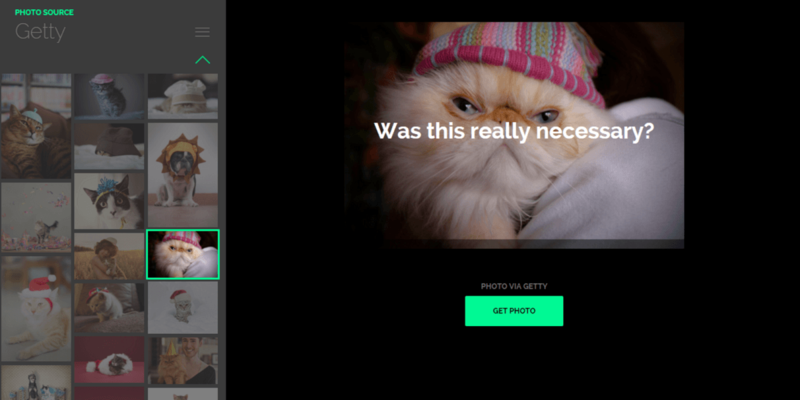 Clicking ‘Get Photo’ takes you directly through to that image on your chosen site. As well as being potentially handy for bloggers, it could save social media managers some time too – particularly as it allows you to overlay the image with any text you like to see how it will look before it’s shared to social channels, and if it looks rubbish, you’ve wasted virtually no time. If you don’t need to add text to an image, you can just de-select the ‘Text on Photo’ option. As it stands, it’ll be a little too limited with its current functionality, but Lior Frenkel, CEO of nuSchool – the company behind Photype – says that the ability to upload your own images and crop to any specific dimensions are already on the way.